Celebrate a life well-lived with this colorful floral tribute. Handcrafted by a local artisan florist, this arrangement is just right for delivering your message of sympathy at a wake, funeral or to comfort grieving family or friends at home. 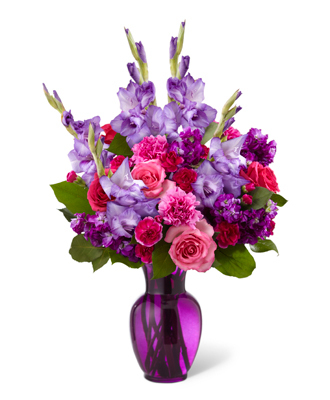 A vibrant composition of mixed flowers in spring and summer colors combines pink roses and carnations, purple stock and gladiolus arranged in a purple glass vase. Style of vase may vary.